Garden Waste Clearance in London ~ Book Us Get 15% Off! Managing large gardens brings many challenges, and it goes beyond keeping them neat and tidy, growing plants and pruning the weeds and overgrown bits that detract from its appearance. Garden waste clearance is a big part of it and dealing with this when you have inadequate compost areas, a lack of workers to hand or insufficient tools and materials to help you deal with the trimmed branches, piles of leaves, freshly cut grass or general waste. 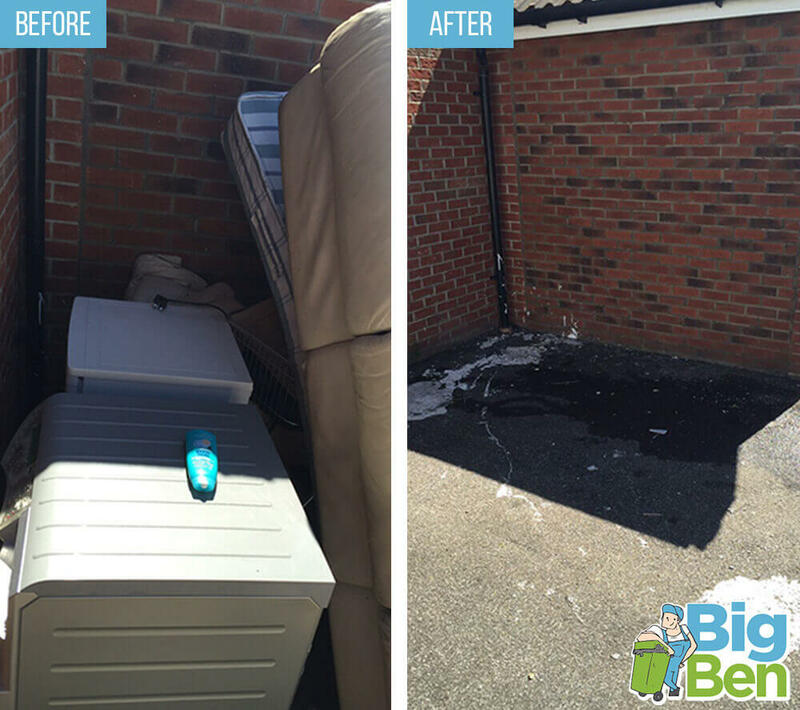 Big Ben is a garden clearance company providing home owners, tenant occupiers, management companies, businesses and sole trading gardeners with a helping hand when it comes to the safe disposal of garden waste, debris and general rubbish removal. Our waste removal specialists are very experienced in dealing with debris and unwanted material from gardening, and disposing of them in an efficient and environmentally friendly manner. We are available on any day of the year bar some public holidays and if you call 020 3743 8686 we can let you know how and when we can come to help you deal with your garden rubbish removal. When gardening has to be done frequently in summer, a high volume of garden waste is created and having this removed from sight is sometimes difficult when there is insufficient space to keep it. Our company offers a garden clearance alternative for people and companies who do not have the storage room for compost heaps, and we can come to your premises and clear anything that does not have a home. If you contact us on 020 3743 8686 with details of what it is that you need us to do we will gladly offer you our very best property clearance services so that you can benefit from the most efficient and reliable garden clearance team in town. Our disposal procedures are very popular amongst customers because we take care to remove waste to the correct location for recycling and decomposing, rather than just adding to landfill. Our eco-friendly mantra makes us one of the most highly regarded garden waste disposal companies. Our workers can handle waste loads of any weight and size and we are able to deal with it all from grass trimmings right up to chopped down trees and old turf from lawns and sports pitches. We have the transport and the staffing levels to be able to cope with all of these things and if you contact us on 020 3743 8686 with a clear idea of what it is that you need us to do we will happily give you a free quote for our services. Our rubbish removal experts use machinery and techniques to lift up all fragments of rubbish from your property, so that you aren’t left with dirt, soil, fragments of leaves and other waste items and the area is restored to mint condition. The thorough approach of our workers and the effective machines and tools we employ go beyond the standards expected of most garden waste clearance companies in the district. 020 3743 8686 is the number to call if you are keen to have your garden waste cleared up by one of the best waste disposal companies around and if you need to know anything more than feel free to speak to us. Big Ben works throughout the week and weekends which enables us to deal with any job for any customer at any time at all in the area – just call us today and we will book you in as soon as you need us to come to you!